Nitra is a city in western Slovakia, situated at the foot of Zobor Mountain in the valley of the river Nitra. Satisfy your inner culture vulture at SNM - Bojnice Castle Museum and Beckov castle. Your inner history buff will appreciate Trencin Castle and Cathedral of St. Emeran. 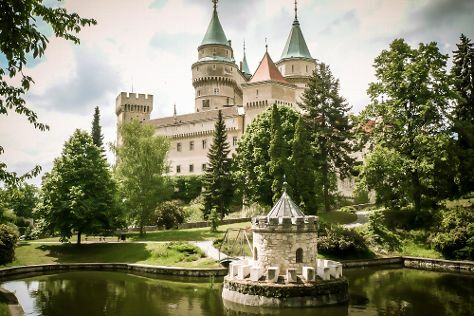 Explore the numerous day-trip ideas around Nitra: Bojnice Zoo (in Bojnice), Trnava (St. Nicholas Basilica, City Arena Trnava, & more) and Cerveny Kamen Castle (in Cerveny Kamen). The adventure continues: step into the grandiose world of Nitra Castle and delve into the distant past at Cachtice Castle. To find ratings, other places to visit, reviews, and other tourist information, you can read our Nitra tour planning tool . Finish up your sightseeing early on the 16th (Thu) so you can travel back home.